I believe this is the oldest Port Charlotte I’ve yet tried—it was bottled in 2013, just short of its 12th birthday. 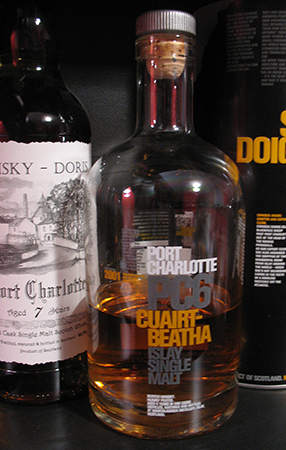 I’ve liked most of the Port Charlottes I’ve had a fair bit (the PC 8 most of all), with the heavy peat masking more or less effectively—as it does in Octomore as well—the sour milk note I usually get from current era-Bruichladdich’s distillate. This one, a single cask from the German bottler, Malts of Scotland, is a sherry cask to boot, and a sherry hogshead at that. It will be interesting to see how the combination of sherry, heavy peat and a bit of age work with this spirit. The age also makes me wonder what Bruichladdich’s plans for the Port Charlotte line are. The Port Charlotte 10 was released a couple of years ago: are they going to be releasing and older version of that as well? And is the cask strength PC series going to keep going? Here is the fourth release in Bruichladdich’s cask strength series of releases of their heavily peated Port Charlotte whisky, the PC8, “Ar Duthchas”. 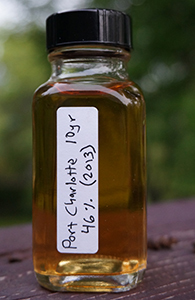 (The barley for the Port Charlotte line is peated to 40 ppm, putting it in the Lagavulin and Laphroaig range.) It was released in 2009 and represents the last release in the PC series of spirit from the original 2001 distillation, making it 8 years old. That is to say, PC 9 is not a nine year old—I’m not sure what year the spirit used in that and subsequent releases is from. The series is now up to PC11—I’m not sure if there’s an endgame for the series or if there’s always going to be an ever-older annual cask strength PC release. At any rate, with unopened bottles of the PC7, 9 and 10 on my shelf I’m not in any danger of catching up to them. I’ve previously reviewed (and emptied) the PC6 and I was not a huge fan of that one. This PC8, however, I thoroughly enjoyed and am looking forward to tasting it again. Bruichladdich’s new 10 yo came online a couple of years ago–the first release of 10 yo spirit distilled and matured by Mark Reynier’s team after they purchased and re-opened Bruichladdich (Reynier himself, alas, has since been pushed out with the purchase of the distillery by Remy-Cointreau). The status of that 10 yo is under a bit of a cloud at present with low availability and not much clear information about its status. I am not too worried about this as I was not quite as excited about my bottle of that whisky as a lot of people were about theirs– but that’s neither here nor there. A year after the new (unpeated) Laddie 10 appeared this 10 yo from their peated Port Charlotte line also showed up, right on schedule. 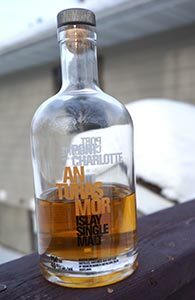 “An Turas Mor” means “end of the journey” or something along those lines in Scots Gaelic and was one of Bruichladdich’s releases leading up to the long awaited release of the regular 10 yo in their heavily peated Port Charlotte line. 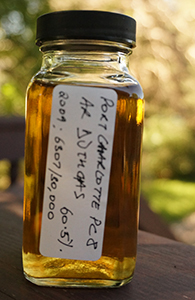 I have a sample of that new Port Charlotte 10 on my shelves and a review of that will likely appear soon as well.